An efficient ID card printer from Datacard. Provide your small- or medium-sized business with colorful, custom ID cards printed in record speed. Datacard SD160 print ribbons can be found in Safe-Card ID online store. LCD screen and an ergonomically designed ribbon cartridge with a drop-in cleaning roller. New TrueMatch™ printing technology uses the latest Microsoft® XPS-based technolgies to increase speed and quality printing. TruePick™ card handling accurately picks cards every time with no adjustment. L 15.4 in. x W 6.9 in. x H 8.8 in. 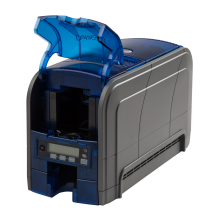 Need help with your Datacard Printer? Our ID printer blog gives step by step instructions for many printer questions.